"The basis of our governments being the opinion of the people, the very first object should be to keep that right; and were it left to me to decide whether we should have a government without newspapers or newspapers without a government, I should not hesitate a moment to prefer the latter. But I should mean that every man should receive those papers and be capable of reading them." Fiscal Story of Bangladesh: Not There Yet, But Can Get There? The current budget (FY10) expects a significant increase in revenue collection, a perennial problem in the country. The target revenue was set at 610.00 billion taka ($8.8 billion) with 261.10 billion collected in the first half and the remaining 348.90 billion in the second. The realization of this target requires a year on-y growth of 16.15%, which, being a notable departure from the trend growth rates was received with sheer skepticism from the economic observers of the country. However, about 33.67% more revenue has to be collected in the second half of the fiscal year as compared to the first half which seems realistic in the light of the fiscal performances of the last 5 fiscal years. 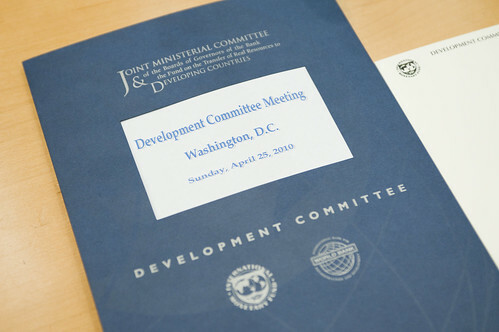 These Spring Meetings will probably be remembered for the capital increase – the first in 20 years – and the historic changes to the voice and representation of developing countries within the Bank. They are important milestones, and deserve to be recognized. But something much more profound is happening within the Bank, something that historians will look back on and regard as a pivotal moment in the organization’s evolution. The key to understanding what is underway is Mr. Zoellick’s speech to the Woodrow Wilson Center on April 14. This was probably the most important speech by a Bank president since McNamara’s Nairobi speech of 1973 – even more important, I would argue, than Mr. Wolfensohn’s 1996 speech on corruption. For the first time in many years, the Bank is at the leading edge of thinking about global trends. Mr. Zoellick’s blunt declaration that the era of the Third World is over and a new, more complex arrangement is emerging, challenges everyone at the Bank and everyone working in development to think and act differently. It sets in context why the reforms underway across many areas of the Bank are really necessary, why we need a new approach to investment lending, to knowledge, to our location and operation as a global bank. The end of the Third World does not mean that there are no poor countries, or that all countries are equally advantaged. It means the landscape has changed so much that our thinking and behavior must shift. To think of China, India, Brazil, Mexico, Russia, South Africa and Malaysia as developing countries seems anachronistic. Yes they have poverty and challenges, but… “developing”? They play a regional and global role of real significance. They have civil servants, academics and businesspeople as skilled as (and many more skilled than) World Bank staff. Developing just doesn’t capture it. "This extra capital can be deployed to create jobs and protect the most vulnerable through investments in infrastructure, small and medium sized enterprises, and safety nets. The change in voting-power helps us better reflect the realities of a new multi-polar global economy where developing countries are now key global players. In a period when multilateral agreements between developed and developing countries have proved elusive, this accord is all the more significant." An increase of $86.2 billion in capital for the International Bank for Reconstruction and Development (IBRD). A $200 million increase in the capital of the IFC. A 3.13 percentage point increase in the voting power of Developing and Transition countries (DTCs) at IBRD, bringing them to 47.19 percent. 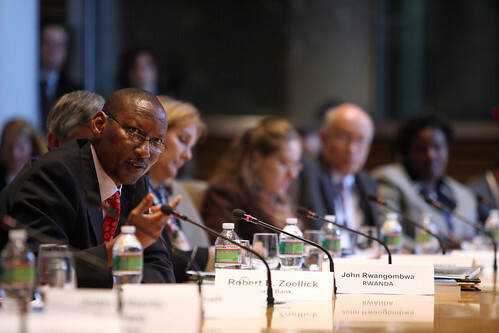 An increase in the voting power of Developing and Transition Countries at IFC to 39.48 percent. An agreement to review IBRD and IFC shareholdings every five years with a commitment to equitable voting power between developed countries and DTCs over time. Even during the busy Spring Meetings here in Washington, my thoughts keep going back to two places I visited this month that lie on either side of the Congo River. I crossed the great river by boat from Brazzaville to Kinshasa, a special journey for many reasons. In Brazzaville, capital of the tiny Republic of Congo, I’d been impressed by the quality of leadership in managing additional financing for one of our projects which addresses HIV/AIDS, and on the other side of the river, I was returning to the Democratic Republic of Congo after a long gap, to find that a health systems rehabilitation project I’d worked on many years ago was in fact thriving and delivering good results. Today being World Malaria Day, I must register that I saw some extremely useful work going on in Kikimi, a very poor neighborhood near Kinshasa. Our partnership with local NGOs to provide better health services across DRC looks like it’s working well here. Instead of just being shown reports on inputs and equipment, which I’ve found frustrating in the past, this time I met a large number of women who told me about insecticide-treated bed nets they’d received during routine visits to their health center and how useful these nets were to prevent malaria. I saw pharmacy shelves well-stocked with malaria drugs, oral rehydration therapy for diarrhea, and basic antibiotics. The project wasn’t perfect but it was delivering results that I could see with my own eyes. "ICTs [Information and Communications Technology] can be the single most important tool of our generation if given the right environment." The consensus at today’s high-level meeting on “Scaling Up Nutrition” was this: the world can do better for its hungry children. Many of the Ministers and donor agency leaders who spoke at the event acknowledged the global commitment to fighting malnutrition had fallen short. As many as 3 million mothers and young children die each year due to lack of nutritious food. OECD figures show that development aid for nutrition has been modest, with commitments of less than $300 million a year – one reason why nutrition has been labeled the “forgotten” Millennium Development Goal.